It's been a big day for hedgehog fans. Along with the Sonic 4 reveal today, Sega has also let slip that Sonic & Knuckles is now Wii-bound at long last. The 1994 title is a follow-on from Sonic 3 story-wise, continuing the journey of Sonic as he takes down the Death Egg, and Knuckles's path as he reclaims Angel Island after learning of Robotnik's treachery. It's also the last title in the original series, setting up the story for the events of Sonic the Hedgehog 4. There's no word yet on whether Sonic & Knuckles will come with the lock-on feature at all (used to gain Knuckles in Sonic 2 and Sonic 3 and Knuckles) or if it will be a standalone title, although the Japanese VC release does have the connectivity in place. However it turns out, Sonic fans certainly have a lot to look forward to in the coming months. Instant down load for me! Never played this game, I sold my Mega Drive then this came out... Had it on a hand held gadget until a friend of mine nabbed it and the Game cube Mega collection. Actually this is my favorite Sonic game. Just wondering how will this work with Sonic 2 VC? Oh yeah, it won't. Damn. Much better news than Sonic the Hedgehog 4 for me. Seperating a Sonic game into several episodes? No thanks. 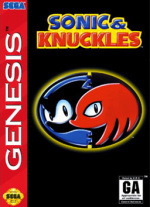 I never actually owned Sonic & Knuckles so it'll be sweet to be able to finally get it for myself. I'm just gonna wait for Sonic Classic Collection on the DS… it has Sonic 1, 2, and 3, plus Sonic & Knuckles! @PJ if the Japanese title locks on then so too should the EU version I would imagine. Sega know they cant release this title without it anymore after the stink kicked up with Ultimate Mega Drive/Genesis Collection on PS3 and Xbox 360 lacking the option. Hopefully Monday we'll get this. I'm pretty sure S3K was intended on being a single game in the first place, but was split up due to hardware limitations at the time. For all we know Sonic 4 may very well be split up into only 2 or 3 "episodes", just as S3K was split into S3 and SK. Cool. But personally I'm gonna hold off buying the VC versions and get Classic Collection instead. I wasn't complaining about Sonic 3 & Knuckles. I see S&K as an add-on for all 3 Sonic games, which is completely different from what Sonic 4 is doing with the episodes. Depending on Sonic 4's price and the actual amount of episodes, I may still get them, but if they release 10 episodes for 1000 points each, or something close to that, then I won't be getting it. I'd like to think they release 4-7 full 3-act zones every 'episode', and total in at 14 Zones. $100 total for 7 - 14 zones is unrealistic and silly :x But I see what you mean; they'll probably keep the overall purchase budget under $40, though. If you're right, which I hope you are, then I might still consider getting it, but I'd still much rather have it as a whole package. I'll wait for now to see if it gets released as one, or how many episodes there will eventually be, at that. This news is still rather disappointing to me, though. I won't be downloading, simply because I still have the original carts for my Mega Drive II. However, anyone who has yet to play this, download it. Now. Thats great news. I hope it comes hear just as soon as ther. What's ironic is that they pretty much did the same thing with Sonic 3. Money being the one of the strongest reasons (Sonic 3 already have some size of considerable stuff off S&K done). They could release it fully but they didn't. By what an Sega representant said it's going for the same way as various people said already. If the same as the jp vc. So how does the lock on work? Does it detect that you have it downloaded somehow or does it just come with all three games? Stop and think a bit. How it was originally and which one of those possibilities is the better for business. This is really an essential title for the VC. I'm glad its finally coming out. 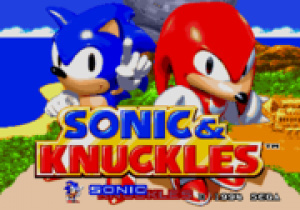 Sonic the Hedgehog 3 & Knuckles... that's the only Sonic game you'll ever need... until 4 comes out, lol... hmmm... Sonic the Hedgehog 4 & Knuckles?! This timing is shameless promotion of Sonic 4. I'm ok with it. I still have it on my Genesis, but it's nice to know that if it dies, I can still get my lockon action! Yay! Time to get me a Wii points card! Looking at the screenshots, I can't help but wonder why I never played this one more. I'll have to give it another go this weekend and see if I can get further than Zone 2. I find this game much tougher than Sonic 3. The Sandopolis, Lava Reef, and Death Egg Zone are pretty challenging levels. I can pretty much breeze through Sonic 3 without losing a life. Another Sonic game in 50 Hz? I regret still that I bought the first Sonic game on Virtual Console especially since the Ultimate Sega Megadrive Collection was released. Here's to hoping to an February release in North America. Nah North America won't wait long... But could Europe have Super Mario Kart? Just imagine that we could really swap, Oh blast- region lock.